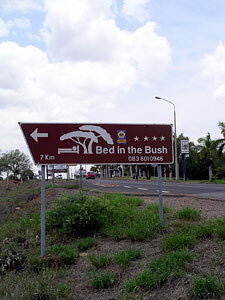 For a visit please follow the signs to Bed in the Bush around Phalaborwa. On entering Phalaborwa, turn left (North) into Spekboom Street and stay on it for 6kms. Be careful of the road when you leave town as there are rather deep "low level bridges". Our gate "Siloque Sisters Farm" is the first gate on your left hand side after you have left town (GPS: South 23.53.28, East 31.08.33).